Aside from being a celebration of love and commitment between the married couple, weddings are also meant to be a fun and unforgettable experience for the bride and groom's family and friends. It's the perfect occasion to bond over good food, delicious cake, free-flowing booze, and, of course, lots of crazy dancing. 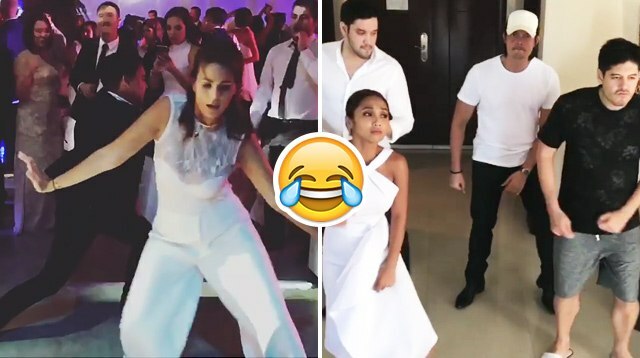 Iza Calzado and Dingdong Dantes, being the awesome wedding guests that they are, didn't hesitate to show off their dancing chops, although in separate occasions. Who did it better? You'll have to see for yourselves. At the reception of the Divine Lee-Blake Go nuptials on Saturday, August 4, Iza danced off with JM Rodriguez. In an Instagram video posted by Iza's partner Ben Wintle, it seems as if not even her immaculate white jumpsuit could've stopped her from going crazy to The Chainsmokers' "Closer." Is she channeling her inner Lady Gaga? Or Michael Jackson? We're a bit confused. Good thing Iza clarified what it actually was in the comments section: "Interpretative dancing FTW! @jm_ro love being crazy with you!!!" When someone asked her for dance lessons, Iza gamely replied, "Hindi ito naituturo, kailangan manggaling sa kaluluwa mo. You have it in you, we all do. Hahaha!" Just a few days later, Dingdong Dantes took his Instagram followers down memory lane as he danced to the '90s hit "Always," along with Carlo Gonzales and newlyweds Rochelle Pangilinan and Arthur Solinap. Although they weren't exactly on a dance floor, all four of them showed legit dancing skills. "Always--'90s kids, AF!" Dingdong wrote in the caption. Fun fact: Both Dingdong and Arthur were in the '90s dance group Abztract (yes, it's really spelled like that), so it's no surprise they got those classic moves down to a T—along with feel na feel facial expressions. Both Dingdong and Carlo are cousins of the groom, who tied the knot with former Sexbomb dancer Rochelle on Tuesday, August 8. Follow Amie on Twitter and Instagram.